Sometimes you want a casual, low-key bar vibe, without the sticky floors of a dark and dank dive bar. Sometimes you want some amazing cocktails, but you don’t want to wait 2+ hours for the latest speakeasy bar that holds max 12 people. 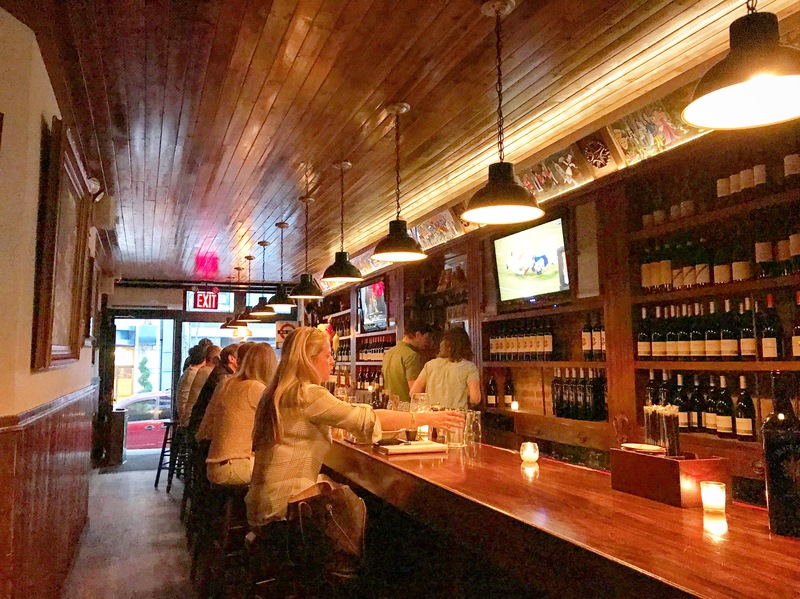 Tucked away in the Upper East Side, Jones Wood Foundry offers amazing cocktails and craft beers, alongside delicious bar snacks as well a full menu offering, in a sophisticated but casual setting. You can stop by the front bar for a quick drink to catch up with a friend, sit in the back restaurant for an elegant dining experience with friends, or pick a table in the quaint courtyard to impress a date. Partner and Chef Jason Hicks honors British culinary traditions while keeping up with modern trends. Hicks and Operating Partner Yves Jadot picked out all the vintage furnishings to decorate the space and also strive to find locally sourced ingredients for all their dishes. Though it is more customary to be drinking beers at a pub, we kicked off our meal with some cocktails. 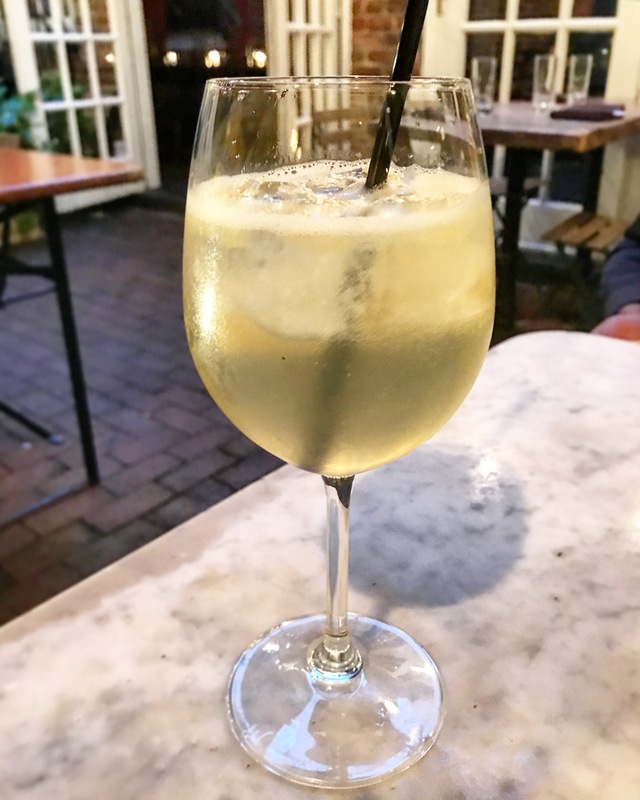 The First Bloom with dry white wine, organic elderflower, lemon, and seltzer, was a very light and refreshing cocktail to start off. 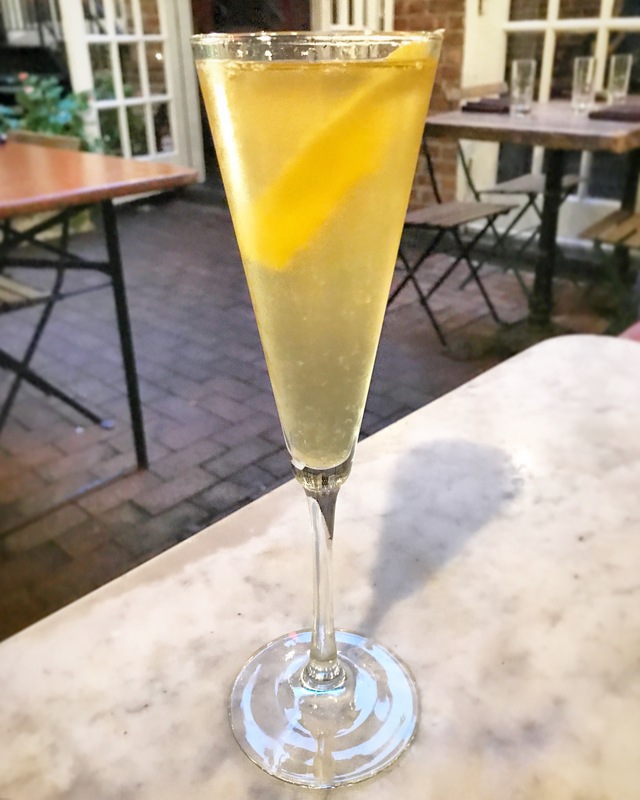 The Earl Grey ’75 with Chapel Down English Brut sparkling wine, earl grey simple syrup, and lemon, was a drier, slightly more potent version of the First Bloom. Both cocktails were a great way to whet your palate without getting you too filled up. Next time we will try one of their beer cocktails: the Blackcurrant Snakebite with Nine Pin Cider, Stella Artois, and blackcurrent, or the Britannia Ginger Shandy with JWF IPA, Crabbies Ginger Beer, topped with a lemon twist. Obviously it’s not real pub fare if there aren’t fish and chips on the menu. 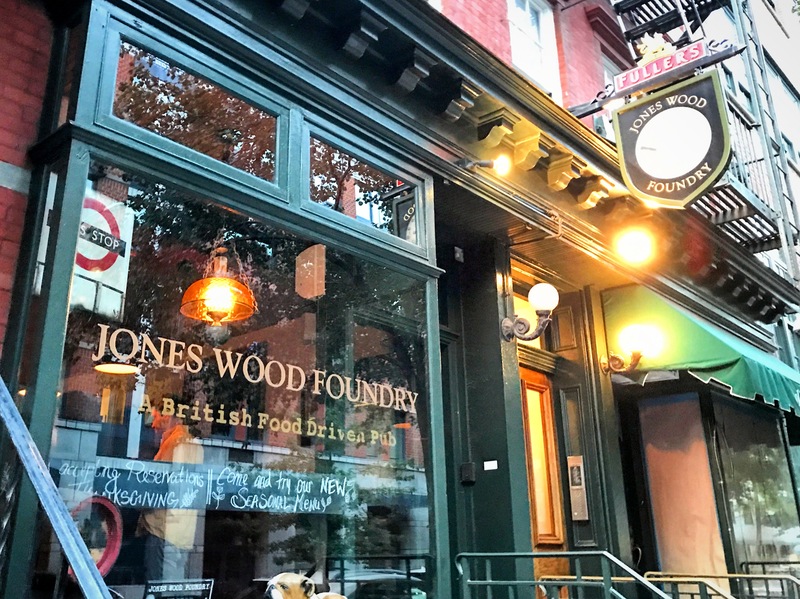 Fortunately for us, Jones Wood Foundry prides themselves on their Fish & Chips beer-battered cod with triple-cooked chips and tartar sauce. 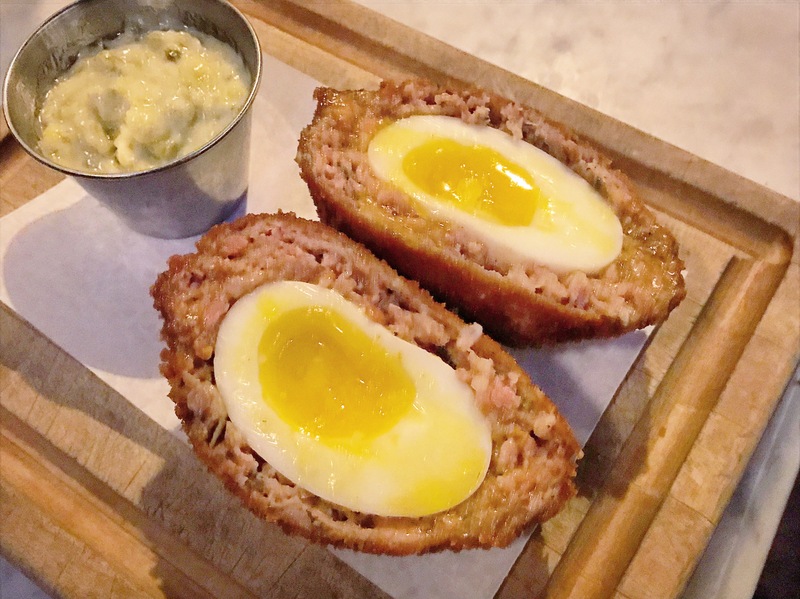 Also popular is the Scotch Egg, also served with the signature startar sauce, and the Yorkshire Pudding Pop-Over with Stilton dip. 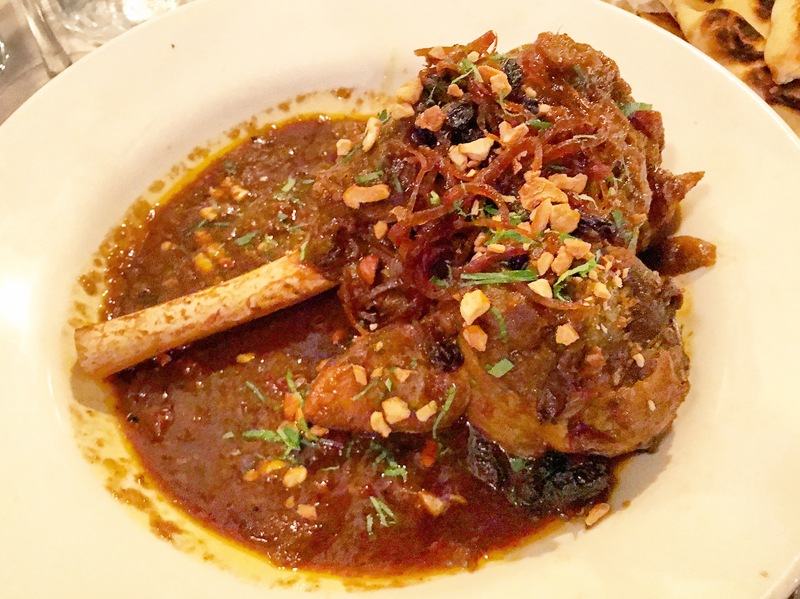 From their “Classics” menu, we ordered the Lamb Shank Vindaloo with citrus chutney, cashews, and a side of Basmati rice. For those of you who may not know, Indian cuisine is highly popular in the UK, and has only been increasing in quality in recent years. The lamb meat was tender and juicy, immediately falling off of the bone into the generous heaps of vindaloo sauce. You’ll want to add the side of naan, which is extra, but use it to scoop up the extra sauce. While there are a lot of spices and the sauce is packed with flavor, it is not overly spicy like how you would find vindaloo in Curry Hill. Other popular items to check out on their Classics menu are the Lamb Shepherd’s Pie with braised lamb shoulder and mash, the Salmon Burger with red pepper and mustard seed relish with avocado and cilantro, and the Roast Chicken with Yukon Gold mash, parsley-buttered carrots, and lemon gravy. All hearty meals that are also great to share. 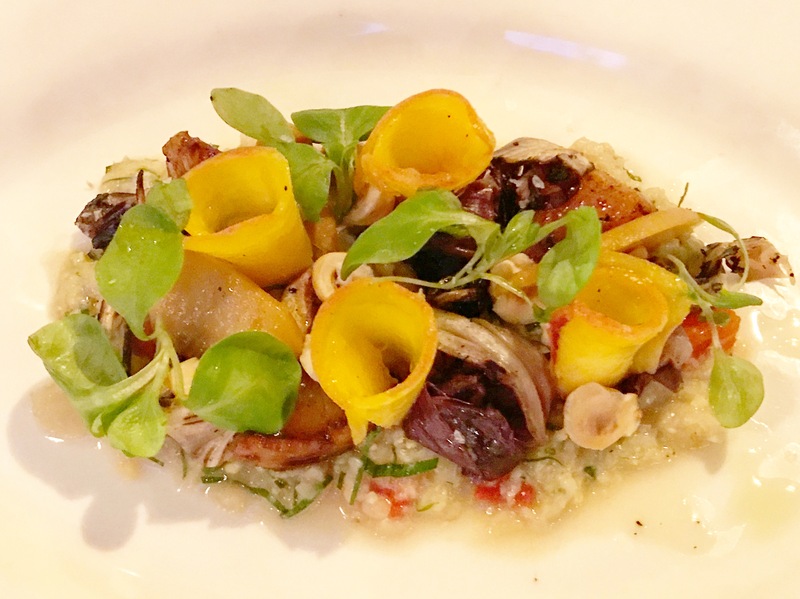 To stir things up, Jones Wood Foundry has also launched a “Seasonal” menu that is updated each month, taking advantage of seasonal ingredients. We tried the Peach Salad with grilled radicchio and fresh corn grits, which was less like a real salad and more of a beautifully plated side dish. The mix of sweet and tangy really makes your taste buds jump. 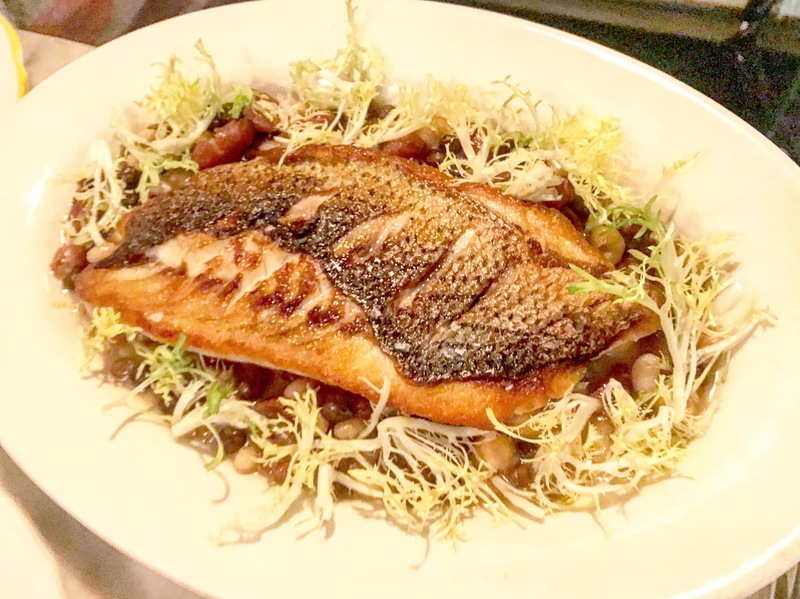 From the September Seasonal menu we also tried the Seared Stripe Bass with eggplant tahini caviar over a bed of five bean salad. The lemongrass dressing really brightened up the flavors of both the fish and beans, overall a great combination of flavors. 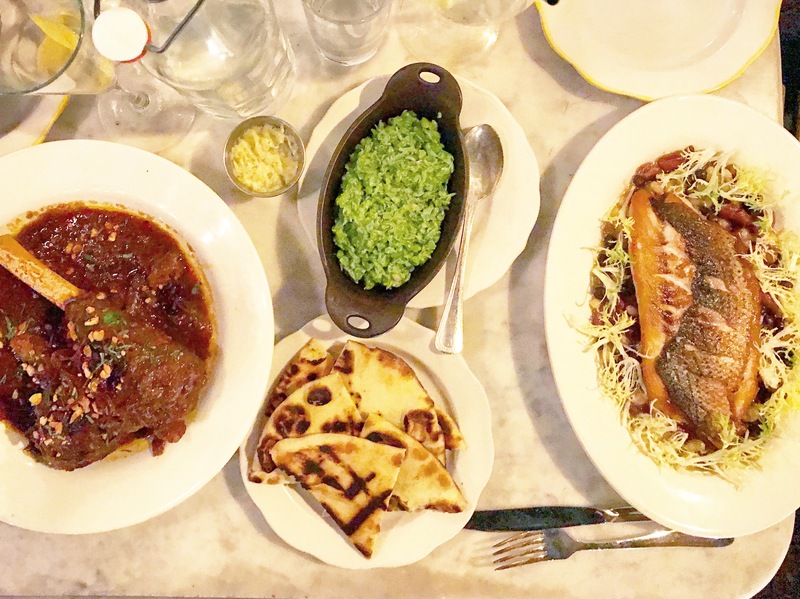 We also were very glad we paired the lighter fish dish to complement the heartier lamb vindaloo. Also recommended by our server was to get the side of Minty Mushy Peas, which was surprising that a little bit of mint can really make a dish of mushy peas go a long way! 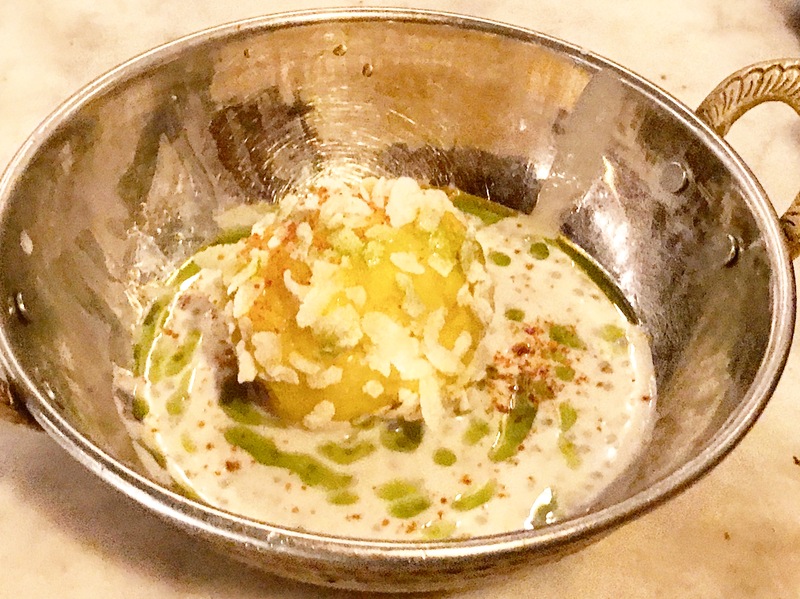 For dessert, we opted for the Mango Sorbet with candied fresno, puffed rice, and coconut-lemongrass drizzle. I usually get a mango lassi to accompany my Indian dishes, so this was a great substitute and a great balance of flavors that was not too sweet. For folks with a die-hard sweet tooth, their Classics menu offers for dessert their Banofee Pie, a Milk Chocolate and Sea Salt Tart (one of the more popular dessert options), and a Sticky Toffee Pudding. 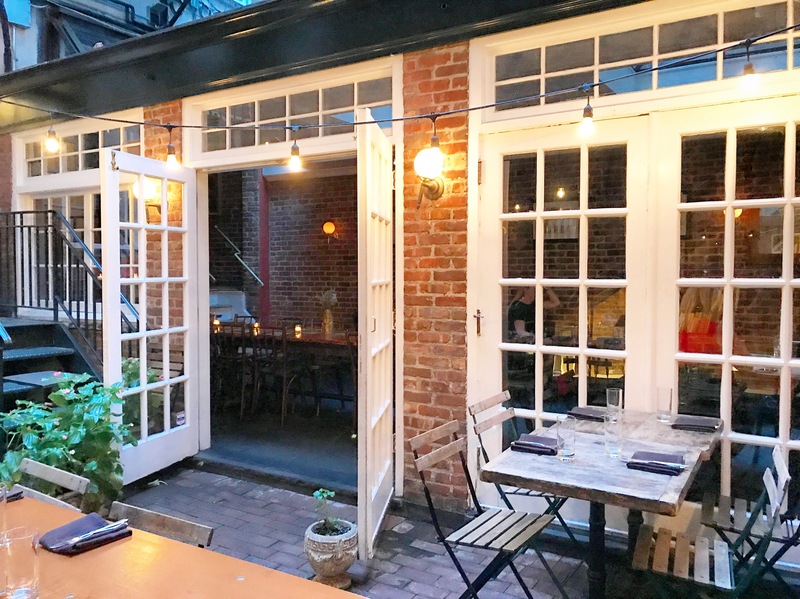 Whether for dinner or drinks, to catch up with friends or for a date night, be sure to bookmark Jones Wood Foundry and make it your next reservation. Also be sure to keep returning to try out their monthly seasonal menus!